In a bowl, mix sugar and eggs together. Add oil to this mixture. 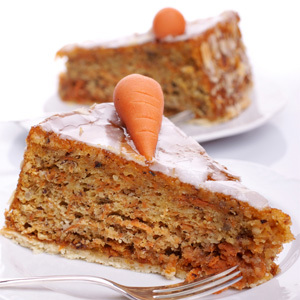 Peel the carrots and crumble them in the mixer. Put the carrots and the cinnamon, continue mixing. Finally add the flour and keep on stirring. Pour the mixture into a greasy cake mold. Cook for 35-40 minutes in 180 degrees pre-heated oven. After cooking, sprinkle powder sugar on the top on it.